Toyota Motor Corp. and Honda Motor Co. said their sales of new vehicles in China hit record highs in 2013, a turnaround from the previous year when demand for their products fell sharply due to the territorial row between Tokyo and Beijing. Toyota’s sales of new vehicles rose 9.2 percent from 2012 to 917,500 units, while those of Honda jumped 26.4 percent to 756,882 units, the carmakers said Monday. Honda’s December sales alone surged 60.4 percent from a year earlier to 101,465 units, also an all-time high. The figures suggest a sign of a dramatic improvement in Chinese consumers’ sentiment toward Japanese autos, despite the lack of tangible political progress in bilateral relations. In 2014, Toyota said, it will aim to sell more than 1.1 million units in the Chinese market, excluding Hong Kong and Macau, by strengthening sales of the Yaris and other compacts. Honda, which hopes to sell more than 900,000 units this year, said it will push the sales of the new Accord sedan introduced in the Chinese market this fall. It is almost certain that 2013 sales of cars and buses in the Chinese auto market, the world’s biggest, has reached more than 20 million units, which is unprecedented by any other single-country market. 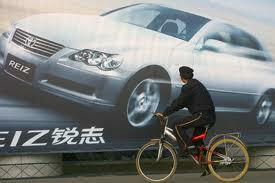 Toyota’s previous sales record in China on an annual basis was set in 2011, while that of Honda was marked in 2010. The Japanese government’s purchase of most of the Senkaku Islands from a private Japanese owner in September 2012 set off a wave of protests and led to a consumer boycott of Japanese products. Categories: Automotive, Design, Links, News, Photo, Style, Tech, Travel	Tags: auto market, automotive, Beijing, China, Chinese, Chinese auto market, economy, Honda, Honda Motor Co., Japan, Japanese, record sales, sales, tech, Tokyo, Toyota, Toyota Motor Corp.